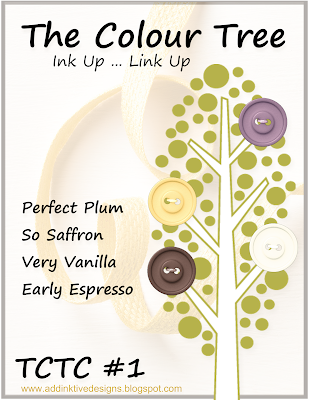 The Colour Tree has a brand new look and I'm so excited that you have stopped by for the very first CHALLENGE right here at addINKtive designs. The colour combo to kick start the year is one of my personal favourites - Perfect Plum, So Saffron, Very Vanilla and Early Espresso. I hope you love it as much as I do. Every Sunday night at 7pm (AEDT) I will be hosting a weekly colour challenge where you can ... Ink Up ... Link Up for a chance to be in TCTC Top 3 Picks! 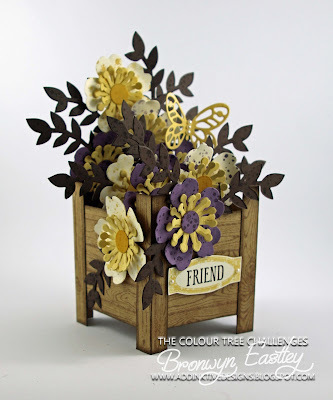 If you follow my blog you will know that I LOVE making 3D cards so I have made another Spring Planter Card Box Card especially for TCTC's Debut and you can check out more of the details in another post, HERE. De Arn's gorgeous clean and simple card showcases some brand new SU products. 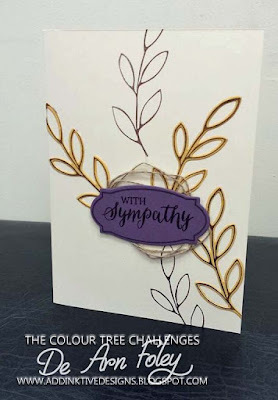 She doesn't have a blog to share her talent but if you check out page 19 of the new Occasions Catalogue, you will see that De Arn has CASED one of the cards using our challenge colours. 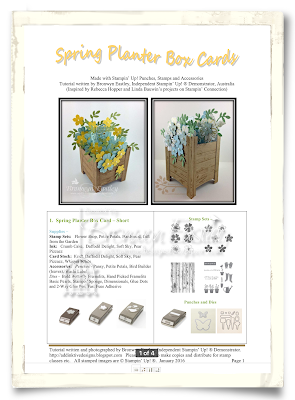 As a special thank you for joining in with the first TCT Challenge, EVERY PARTICIPANT will receive a PDF of a brand new four page tutorial on how to make a Spring Planter Box Card (You must stick to the challenge guidelines in order to qualify). Two tutorials for SPB cards have been posted on my blog for a few months now but I decided to put them into a single document to give away! You are free to make your own copies to distribute at stamp classes, camps etc. So what are you waiting for? Hope to see you in the gallery. Deadline for entries close on Saturday 16th January at 7:00 pm (AEDT). Top 3 winners will be announced on Sunday 17th January at 6:00 pm (AEDT) and a new challenge will start an hour later at 7:00 pm. See time/date converter HERE for your region. Hi Bronwyn, I just found your challenge and am very excited. Love the page design and am getting ready to haul out the colours so I can link up my card for your very first challenge. Thanks, Heidi! I'm excited that you're excited! I love putting colour combos together and have got 19 posts already loaded up on my blog to take us through to the launch of the new annual catalogue and the launch of some NEW in colours! I joined the challenge and added a link to my blog but the photo of my card does not appear on this website - only an empty box with the title of my card under it (On the Fringe). Clicking on the empty box does take you to my blog. I was wondering if I should delete and re-enter the link? All sorted now, Gloria. Thanks for joining in.